As I sit in my husband's office viciously trying to complete my classroom library organization (more on that in a later post), I came across a cute linky party from The Applicious Teacher that will allow me to share some of my ideas about my future classroom! The inspiration for my classroom theme came from these two cute green and blue buckets that were actually my husband and I's Easter baskets from my mom. I later found an adorable hot pink planter to complete my theme: lime, teal, and pink polka dots (with some accents of orange). I already have a lot of teal and lime containers and decorations from my last classroom, but adding those pops of pink and orange will look really cute! I'm still planning on using black fabric for my bulletin boards too, to make the colors really pop. I bought some adorable borders from Frog Street (they are reversible too) that match the colors in my theme. Here are some more ideas from Pinterest of different decorations I plan on using in my fifth grade classroom. I plan on buying teal, orange, blue, and green paper lanterns to hang around the room. Source. 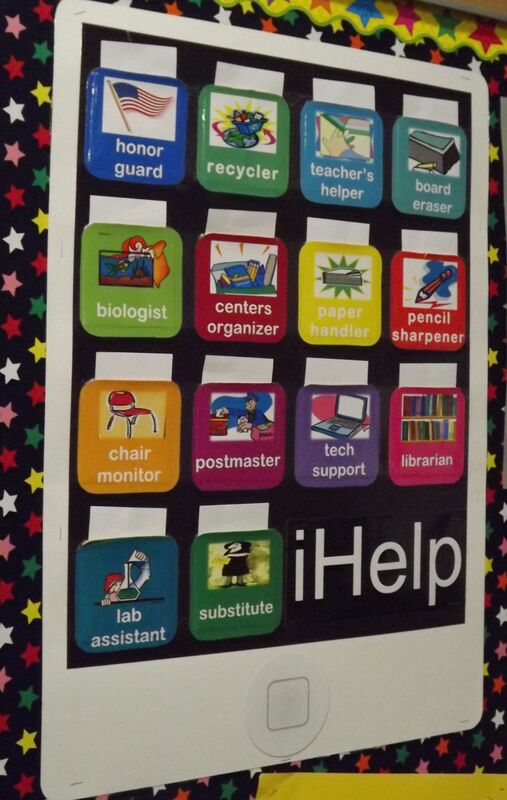 Love this iHelp classroom jobs board...and it's perfect for 5th grade! I already have several lime and blue pins like these from this classroom to use for my library, but I plan on adding some orange and pink bins as well. Although...I do love Erica's actual job list. She has great ideas! This bulletin board would be so cute in my classroom library! These dinosaur containers are going to be a Pinterest project for sure. I am going to be "Tackett's Pterodactyls" next year. Love this Birthday board from Erica's room...and she even has the same borders that I ordered! I love the idea of transforming a cookie sheet into a classroom hall pass system! I've got my work cut out for me this summer! I'm so excited though! :) Be sure to link up to see some more great classroom decorating ideas!